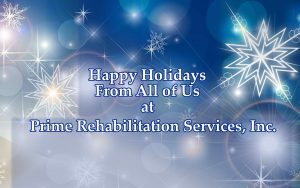 Happy Holidays from Prime Rehabilitation Services, Inc. Thank you for continuing to support Prime Rehabilitation Services. It remains our honor to positivity impact the lives of so many in need of therapy services. Wishing you a wonderful holiday season filled with warmth and happiness. Subscribe to our Prime Rehabilitation Services Blog and receive our exciting updates!